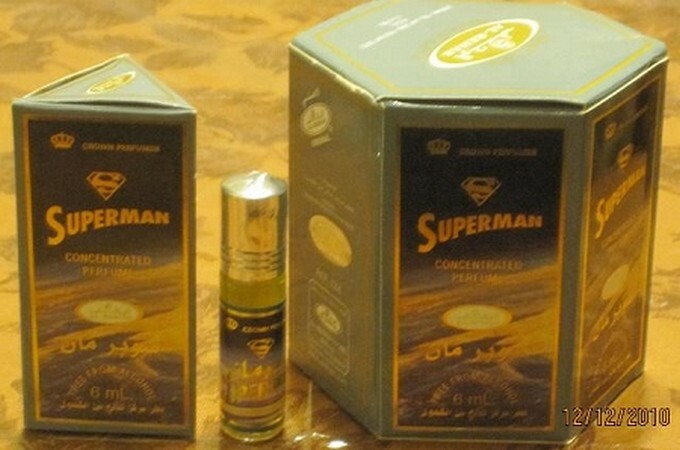 Al-rehab scents often open strong and Superman is no exception. It's a big blast of clove and spices that initially produces a somewhat smokey effect, similar to the original Jacomo de Jacomo , or Open by Roger % Gallet. 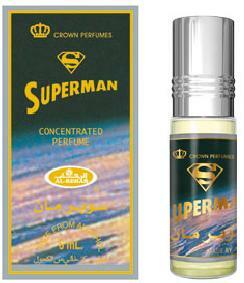 Superman dries down into a strong, super-clean scent, to my nose reminiscent of Dial gold-bar soap. Excellent stuff! All the Al-rehab fragrances I've tried so far are an incredible deal for the money! Don't be fooled by the title. This is a strong and pleasant musk fragrance with sweet Arabic spices blended to perfection. It has a very warm and inviting smell. Classic! ...World Famous Al-Rehab Luxury Perfumes. The Sultan of craftsmanship, expertise in Middle Eastern-Oriental Attars and innovative blends of pristine quality. Featuring high grade super concentrated perfume oil where price is never an option! I have worn Superman for well over a year and get stopped often by women and men loving this scent. It's not to strong for a women to wear, it truly blends with your personal body chemistry. This is my top scent for all seasons. Women you will not be disappointed!! Instantly became my favorite perfume (oil) of all-time! Masha Allah. I love Al-Rashad Books. Alhamdulilah and may Allah continue to bless them.